Hello, I really like this painting! But if I purchase this ,were it including invoice? Because my company need it. Which species are the Pterosaurs? 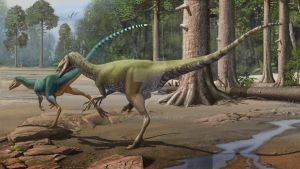 Hmmm, I said Mamenchisaurus hochuanensis because of the tail, but maybe M. sinocanadorum had the same structure! I don't think there's even a point anymore to saying how amazing you are. It's all been said before. 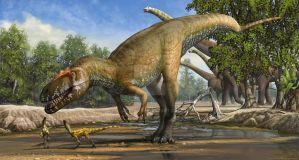 I here there is a Memenchisaurus subspecies over 100 feet in length. I think there may be a slight problem with the perspective though. The rock seems really close to the viewer, but the mamenchisaurus head seems quite far away. Unless it wasn't eating from the rock, in which case the rock is placed weirdly, cos the viewer's mind keeps conflicting between eating from the rock or not. don't really know if I explained it well....do you see it? Wow; amazing work. I love the color choices and skin patterns/textures/tones. Как обычно - просто фантастическая работа! При пристальном разглядывании смущают только откровенно голокожие рамфоринхойды (парапсицефалы?). Просто шерсть редко бывает с желто-салатовыми разводами, такой узор подсознательно ожидаешь увидеть на голой коже или на чешуе. А на самом маменхизавре - какие-то анурогнатиды? And... that's my new desktop. Incredible work. 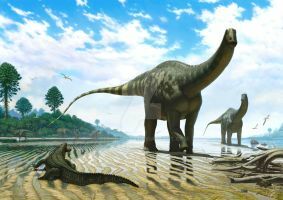 My favorite sauropod! Fantastic work as always! Atrox, you are to paleoart in 2013 what Mark Hallet was to paleoart in the 90's. Absolutely gorgeous. That's one hell of a long neck! Awesome~! The amount of detail is breathtaking. I have so many sketches of dinosaurs in my paintings and this really inspires me to actually use them. Thanks for the inspiration! Conveys their awesome scale very well. Tremendous piece. Lovely neck patterns, never seen anything like that before. Contrasts nicely with the bright green Pterosaurs. By far my favoritest painting you've done! 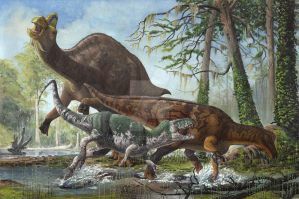 Hope you do more Sauropods and Stegosaurs. Досі моя улюблена картина, що ви зробили! 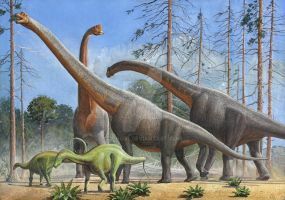 Сподіваюся, що ви більше Sauropods і стегозавра. 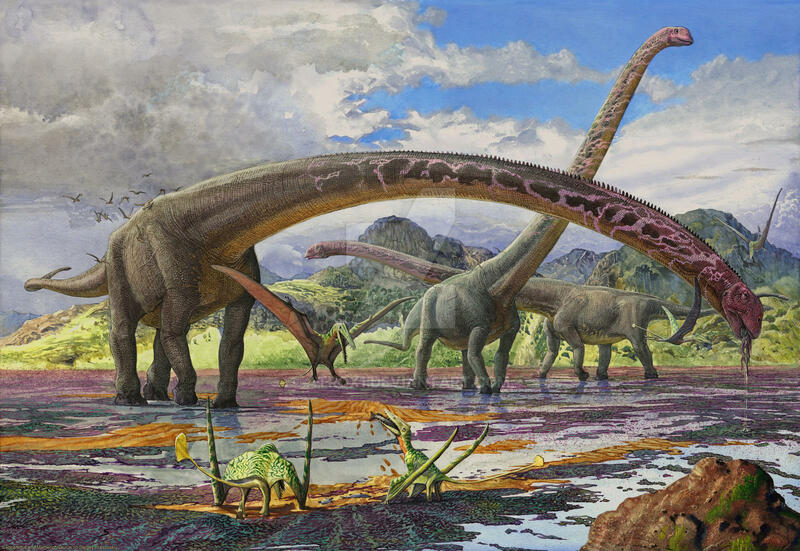 Quite an original scenery for a sauropod piece. Nice. 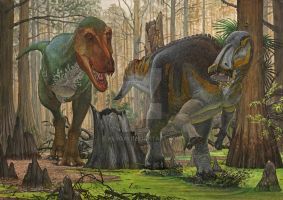 I also like the fact you gave the Mamenchisaurus some bright color on their heads. Those animals were so big, they didn't need subtle camouflage. Very beautiful work as always.